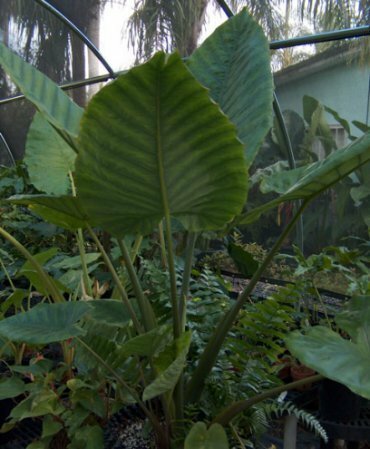 Alocasia robusta - the Giant that will bring you to your knees! Impossibly huge leaves and plants are often the Holy Grail for tropical plant lovers, whether their gardens are in the deep tropics or in temperate zones. 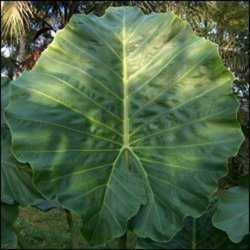 None other is more sought after than Alocasia robusta, the plant with the record for the largest undivided leaf in the plant kingdom. However, I venture to state that none other has broken more tropical gardener hearts than this plant. Read on to see why. . . While exotic flowers and beautifully colored leaves are essential elements in the well-rounded tropical garden, giant plants with monstrous leaves are an absolute must. Without these behemoths, your tropical garden can come off looking like something a little less than truly tropical. That's one reason why banana plants, elephant ears, or Gunnera are so ubiquitous in tropical plantings. We who wish to live in the midst of tropical splendor gravitate towards the largest, lushest and most spectacular foliage we can find (and afford) for our gardens. In the size department, no other plant can hold a candle to Alocasia robusta. This plant is reputed to attain sizes that would make it quite at home amongst dinosaurs. Imagine leaves 12 feet long on a plant 20 or more feet tall! Just the thought of it starts the drool flowing. But you must realize that your path to this lush fulfillment is already littered with the broken hearts of many who have gone before you. But it was healthy when I got it! That lament has been heard from many a tropical grower across the land who, having obtained their little Robusta after long and hard searching, discovered a week or so later that it had melted to nothingness in its pot. I, too, have experienced this, and more than once. However, die-hard tropical gardeners will not accept one failure as proof that a plant cannot be grown. After all, we can learn from our mistakes. We just need to find out that detail we have overlooked, and all will be well. Then people will come from far and wide to gawk at our 20 foot tall Robusta. Right? Well, not exactly. . .
After losing 10 little Robustas, each of which started out really healthy looking and fast growing at the start, I began wondering if some exotic, terribly lethal microorganism has been imported unwittingly with my Robusta plants. I was half in a panic, thinking that if this horrid bug spread to the rest of my Alocasias, I would lose them all within a week. As things turned out, that was not the case. However, that knowledge did not ease my pain at losing all those Robustas. So I resolved that I would dedicate myself to finding out what the problem was so I could, at long last, finally grow one of these humongous Alocasias to maturity for myself. A bug for the Robusta? 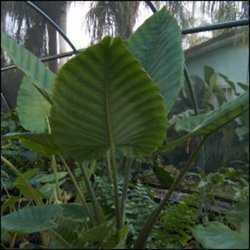 Alocasia robusta hails from an area that is the most tropical of tropical: the Indonesian archipelago group, known as the Malesian region. Plants growing in this area would see temperatures in the 50s only if you wrote the temperatures on a piece of paper and showed it to them. Upper 70s, 80s and 90s are the norm, even at night, as are high humidities and calm winds. This is nothing like what we find here in the continental United States, even in our warmest zones. Summer days in south Florida are the closest we get to it, except when a hurricane comes calling. 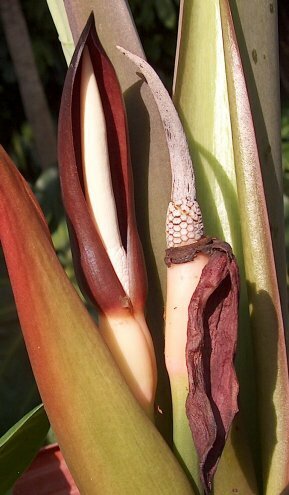 I began to wonder if there existed some beneficial bacteria or fungi that lived in association with the Robustas, helping to fend off the nasties and enabling this Alocasia to grow, mature, flower, and fruit. If this plant were as finicky in its natural habitat as it is in my garden, it would have gone extinct millenia ago. Acting on this hypothesis, I tried several of the commercially available biocontrol products. To my delight and surprise, I did manage to keep some Robustas alive long enough to prove that I might be on to something. Alas, I then found that a nice Robusta is like gourmet food to red spider mites, and that just a little cool weather can flatten out an otherwise healthy Robusta. Finicky is not a strong enough word for these plants! Since I'm not one to be content with only partial success, I continued the search for more answers. I wondered whether some other plant might be growing together with Robustas in the wild, acting as a symbiotic partner to assist them in reaching maturity. To test this, I pored over pictures of A. robusta growing in the natural state. In most of the pictures I studied, I saw a fern that looked surprisingly like a fishtail fern, Nephrolepis biserrata, growing in proximity to the Robusta. With gleeful excitement at this newfound observation, I rushed to obtain some plants of what is known locally as "Macho Fern." I planted them in together with a few Robustas and then watched for hopeful signs with bated breath. While I was experimenting with this version of companion planting, an unexpected surprise enabled me to do something I thought I'd have to wait years more to attempt. As I toured a good friend's nursery, I noticed a few Robustas just hanging on in amongst other, more common, Alocasia plants. At first I was about to turn away because the plants looked about as ragged as I'd ever seen. They were no larger than ones I had grown. But something caught my eye, something I could not believe I saw there. One of them was in bloom! I was instantly beside myself. The plant had two blooms; one of which was spent already, while the other one had not yet opened. I gently snatched up the plant and took it to the office, readying my breathless entreaty to my friend. Anxiously, I asked him if I could borrow this plant for my hybridization work. Imagine how I felt when he agreed and I had the plant safely in my car, on the way back to my tropical home. So, sooner than I ever thought possible, here was my chance to cross the incredibly finicky Alocasia robusta with something easier to manage and grow. And so I did! Even while I watched my other Robustas together with ferns growing better and more vigorously than any I had ever seen or grown before, I was able to obtain Robusta pollen and produce hybrid seeds from it. I knew that no matter how well the Robusta grew with the ferns or with the biocontrol products, neither was going to help in winter when cold weather reared its ugly head. That problem could be solved only by crossing the plant with another, hardier, species. In the final reel, I did it, and now I have them. 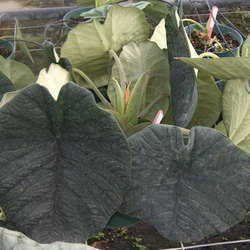 Young Alocasia x robudora plants are presently growing happily for me. These soon-to-be huge beauties have weathered a cool spell this winter without skipping a beat. This summer, I'll get to see how big they can grow. Talk about anxious anticipation! Oh, and by the way, the thumbnail picture at the beginning of this article is one of my Robustas growing together with the Macho Fern. At that time it was, arguably, the largest A. robusta in the continental United States. Since then, the cold snap we had this January flattened it out, much to my dismay. But all is not lost, as it may yet bloom this Spring. If it does bloom, I've got plans, BIG plans, for it! My Alocasia 'Borneo Giant' is in full bloom, and I feel it longing for some pollen from a seriously huge-growing plant. . .
Twelve foot leaves, on a 20 foot tall plant? Hope springs eternal this summer!